On the 3rd of January 1983 Brendan Ferguson was given the charter which formally established the 15th Galway Unit of the Catholic Boy Scouts of Ireland. With this charter he was charged, along with those whom he choose to assist him, to impart the principles and the aims of the C.B.S.I. to the young scouts of the Unit. Brendan carried out this task diligently and was ably assisted in so doing by the following leaders: Frances Geoghegan, Main St, Bernadette Mc Donnell, Wellfield, Josephine Clancy Maghermore, Jim Parslow formerly of Claremount, Mick Maloney, Glann and Gerry Nash, Portcarron. Mary Dixon, Oldchapel. Marian Earls, Portcarron, and Grace Conneely, Ardvaarna joined the group later. The leaders were invested in full uniform members of the C.B.S.I. and they were in turn greatly assisted by non uniform friends of the scouts like Jackie Murray, Jimmy Kelly Baurisheen, Michael Duffy, Baurisheen, Fr. Murphy R.I.P., Fr Hallinan, Declan Mc Dermott, Claremount (Treasurer) and Peg Ferris, Cregg, (Honorary Secretary). 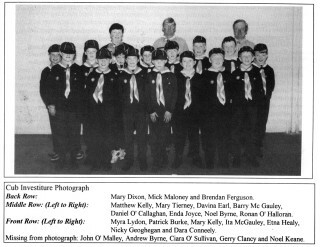 It would be wrong to infer that the Boy Scouts of Oughterard suddenly started their Unit on the 3rd of January 1983. 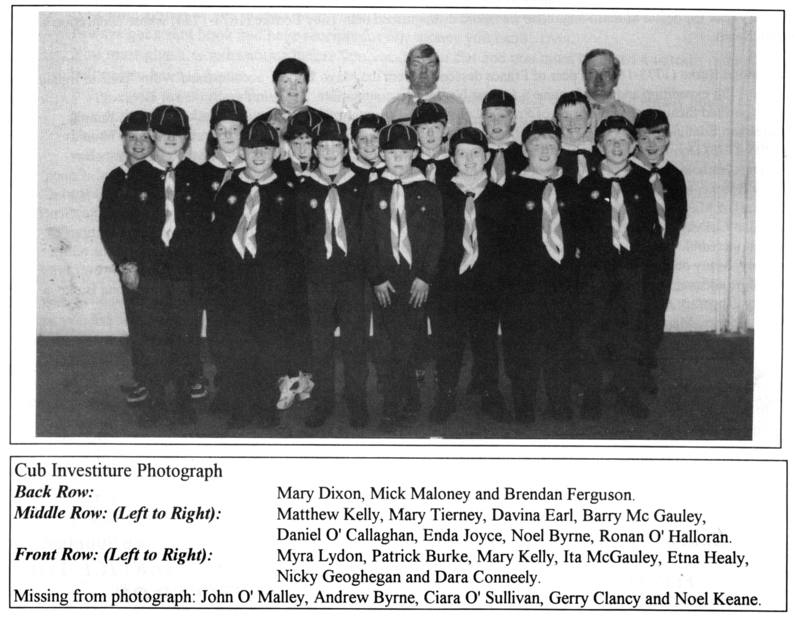 Brendan, Frances and Bernie had actually begun work with young cub-scouts early in 1982 and it was because of their enthusiasm and genuine interest in the young members in their care that persuaded the Chief scout and Commissioner, together with the National Executive Board of the C.B.S.I. to present them with the formal charter of the association, a charter never lightly given. In fact, the unit was held in high esteem within the association. This was announced publicly when the Chief Scout of Ireland, Mr. Paul Ring visited the Unit. In the 1980’s over 70 young cub-scouts were invested in the Unit and participated in the various activities of the Unit. The activities ranged from camping adventures, parades, to activities closely associated with the scout movement. The scouts were taken camping to Gort, Rinnville, to cook-outs in Glann, to regional cub scout days in Clarinbridge, St. Mary’s College, to regional cub- scout competitions held with other young scouts in Galway, to the Annual St. Patrick’s Day Parade (where incidentally the Oughterard cub-scouts were part of the winners in the Marching Groups in the 1990 Parade). In the early 90’s the Unit expanded to Full Scout Unit (ages 11yrs- 15 yrs). More was now expected from the boys and girls. The activities were more challenging. The unit won Galway Title as the best Scouting Unit and earned a place in the Melvin Cup (The All Ireland of Scouting). At this level the scouts had to be proficient in pioneering, (constructing and running a camp rite using timber and sisal no nails), orienteering, First Aid (tests set by the Order of Malta), Hiking (overnight in wooded terrain using Ordinance Survey Maps) and Sporting Activities. The young scouts involved themselves enthusiastically in such Boy Scout activities as Bob-A- Job, camp organization and hiking. They also held “The Martin Feeney Perpetual Trophy” as the best Unit in the “Bob-A- Job Stakes” in the whole Galway region. The Unit ran its activities in a secure and safe atmosphere and held an excellent safety record – that is not to say that the Unit was not visited by tragedy. The Unit was deeply upset when Michael Parslow a member of the Unit was called to God on the 6th February 1989. The Unit, after Michael’s death, adopted Michael as their Patron and intermediary with Christ, Our King. The activities carried out by the Unit at their weekly den meetings are too numerous to mention. They would warrant a separate article – suffice to say that it was not work all the time on the skills of scouting. They did have their moments of adventures, hilarity, fun and games. 1. To be grateful for the gift of Faith. 2. To cherish their faith all their lives and to be faithful to its practice. 3. To love their country. 4. To perform their duty in and outside the home. Unfortunately scouting came to an end in Oughterard not because there was a shortage of young boys and girls interested in joining the Unit but because the Unit did not have a full compliment of leaders. The founding leaders gave their all and were committed and dedicated to the Unit and they rightly expected that they would be replaced by new enthusiastic leaders. This did not happen and as a result the Unit disbanded. Is it possible in 2012 that there are enough interested adults in Oughterard willing to start a new Unit? Note: A special word of thanks to Gerry Nash who supplied the information for this article. This page was added on 22/01/2012.